Habit: Shrub, evergreen, much-branched; dioecious. Stem: bark smooth. Leaf: opposite, simple, leathery; base jointed; stipules 0. Inflorescence: staminate flowers in axillary clusters, pistillate generally 1. 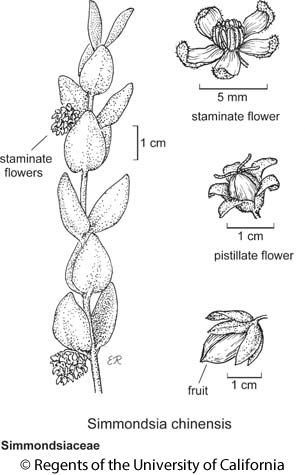 Flower: small, radial; sepals generally 5, overlapped, becoming larger in pistillate, disk 0; corolla 0; stamens 8--12, free, anthers elongate with longitudinal slits; ovary superior, chambers 3, styles 3, stigmas long, +- not persistent in fruit. Fruit: capsule, loculicidal. Seed: 1. Genera In Family: 1 genus, 1 sp. : southwestern United States, Mexico. Note: Recently shown (e.g., Carlquist 2002) to be not closely related to Buxaceae, in which it was sometimes placed; 2° growth unusual, produced by successive cambia. Habit: Hairs short, dense, appressed, less dense in age. Stem: 1--2 m; new growth +- hairy; branches stiff. Leaf: 2--4 cm, oblong-ovate, dull green, subsessile. Inflorescence: peduncle 3--10 mm. Flower: staminate sepals 3--4 mm, +- green, pistillate 10--20 mm in age; anthers yellow. Fruit: +- 1--2.5 cm, nut-like, ovoid, tough, leathery, obtusely 3-angled. Seed: large, including liquid wax. Chromosomes: 2n=26. Ecology: Creosote-bush scrub, desert wash scrub, chaparral, coastal scrub; Elevation: < 1350 m. Bioregional Distribution: s SCo, PR, s DMoj, DSon; Distribution Outside California: northern Mexico. Flowering Time: Generally Mar--May Note: Important as forage pl; seed wax a substitute for sperm whale oil; fruit edible. Synonyms: Buxus chinensis Link; Simmondsia californica Nutt. Citation for this treatment: Robert E. Preston & William J. Stone 2012, Simmondsia chinensis, in Jepson Flora Project (eds.) Jepson eFlora, http://ucjeps.berkeley.edu/eflora/eflora_display.php?tid=44601, accessed on April 19, 2019.
s SCo, PR, s DMoj, DSon; Markers link to CCH specimen records. Yellow markers indicate records that may provide evidence for eFlora range revision or may have georeferencing or identification issues. Purple markers indicate specimens collected from a garden, greenhouse, or other non-wild location.